This isn’t about the book above, but I don’t have any pictures I’ve taken of the show so I needed to use something I did have a picture of. Anyway, I digress. I was lucky enough to score a free month of CBS All Access, and then I bought a pin which granted me a giftcard that would allow for a few more months of free access. I specifically got this subscription because I am a Star Trek freak (aka Trekkie, or even Trekker, depending on your experience). Star Trek Discovery takes place after Star Trek Enterprise, but before the original series. While these are the shows least familiar to me, Star Trek Discovery was interesting to me because of the strong female lead, a character (pictured above) by the name of Michael Burnham. Raised by Sarek and Amanda (yep, Spock’s parents), along with Spock, Burnham has the distinction of being the only human to attend the Vulcan Learning Center. Burnham survived the murder of her parents by the Klingons. She survived an attack by Vulcan extremists of her person as a child, being clinically dead for three minutes. MIchael was placed on the USS Shenzhou after graduating from the Vulcan Science Academy by Sarek. He knew Captain Phillipa Georgiou would allow her to blossom, eventually becoming the first officer of the ship. Georgiou takes Burnham under her wing and continually worked to make Michael into a strong, confident woman. And then, through a series of crazy circumstances, Burnham mutinies and starts the Klingon war. With most of her ship dying, including Captain Georgiou, Burnham returns to Starfleet as a mutineer and prisoner. 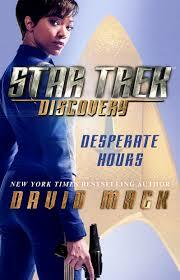 She is transported to the USS Discovery before being taken into prison and her life changes once again. I’m not going to spoil this as much as I want to. I want to fangirl all over this show, but I can’t because I cannot ruin it for you!!! It’s that good. And while I know there are issues with the way its broadcast (you have to have a subscription to CBS now to watch anything but the first two episodes), and that some people are up in arms that its about a woman, I just want to say that’s BS. I’m paying for this show because I want to see a strong woman take the reigns of the hero in the hero’s journey. Sonequa Martin-Green is a true gem. Add to that the amazing Michelle Yeoh as Captain Georgiou and I was down for watching this show before any other details were leased. And it doesn’t disappoint. While I watched the first two episodes when they premiered, I waited to see if I could get a few more episodes in (there are 9 so far) so that I could binge episodes at a time, and it was a LOT of fun. I have to confess that I’ve never really meshed with a Vulcan character, and while Burnham is human, she thinks similar to a Vulcan, in fact, she reverts to a lot of logic-based thinking more than some of the Vulcans in the series. However, she is at her core human, and a smart, dedicated officer who failed the person who took her under her wing. Burnham actively mourns Georgiou’s death and her part in that death. But Burnham also sees the part she has to play, and heads over to the Discovery. She’s able to solve puzzles and if she’s not winning people over, she is at least showing them that she isn’t the mutinous legend they’ve all heard about. She also has a LOT of heart, and her actions really drew me into the show. The show is a bit darker than I would expect of this franchise. But, since it is the newest it also has the best graphics and believable makeup applications. There are species we haven’t seen before, and also characters we will most likely not see again. And the Klingons are a lot different than I remembered. They’re scary. And that makes their threat all the more real. It’s an amazing feat with this show. Throw in supporting cast like Anthony Rapp, Jason Isaacs and Rainn Wilson and you have a compelling, strong volume in the Star Trek franchise.